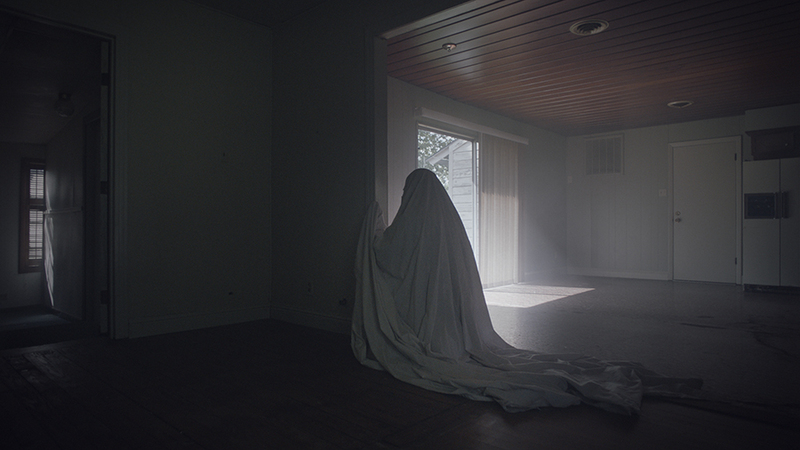 The plot does, admittedly, revolve around Casey Affleck wearing a sheet and just kind of hanging out. But it’s not nearly as silly as that sounds, I promise. In fact, there’s almost no levity to be found in the Ain’t Them Bodies Saints director’s latest film. This is destined to prove hugely divisive among audience members, but those who feel it will find a unique, moving treatise on love, loss, memory, and the passage of time. C (Affleck) and M (Rooney Mara) are a young married couple about to move out of their longtime rental home. C’s having problems letting go of the history there, while M has an eye on the horizon. Before they relocate, C dies in a car crash, only to come back as a ghost, complete with his new lazy-child’s-Halloween-costume style. And that’s more or less all in terms of plot. He just stands there, unable to connect with M, watching at a distance as time passes in fits and starts and loops. This includes a much-discussed single, static, five-minute take that’s nothing more than Rooney Mara sitting on a floor eating an entire pie and weeping. Again, it’s not as silly as that looks on paper. The moment actually plays quite devastating. Somehow, through eating a pie, not saying a word, Mara conveys love, longing, grief, frustration, pain, anger, and a wider range of emotions than you find in most complete movies. She’s phenomenal in A Ghost Story, despite the fact that she rarely speaks and barely interacts with the ghost, who’s the only other character in most of the film. Affleck’s performance on the other hand is harder to get a read on. As mentioned, he spends roughly 90% of the movie covered by a sheet. Beyond that, he scarcely moves, standing in place, lurking in the background. So obscured, there’s no nuance of expression or movement to respond to, and in reality, it could be anyone under that sheet. Or even, in especially still moments, a Casey-Affleck-shaped block of wood. 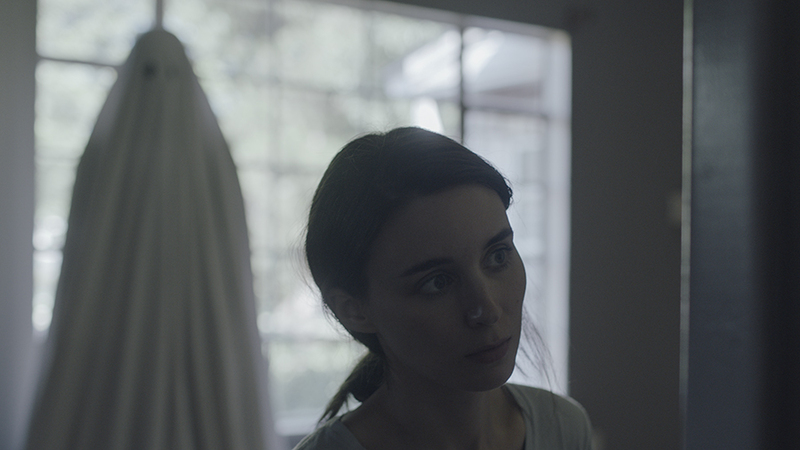 A Ghost Story relies on external cues to convey meaning. 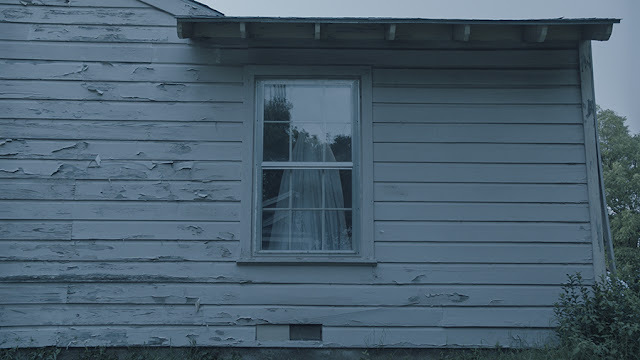 A still, white, expressionless figure gazing out a window only says so much. But long, unmoving takes, the droning music, and sly visual tricks infuse the film with import, until C’s own frustration, yearning, and emotions seep through and impact the world around him. Lowery employs horror movie tropes like flickering lights, moaning winds, creeping fog, and even an escalating, horror-ish score. 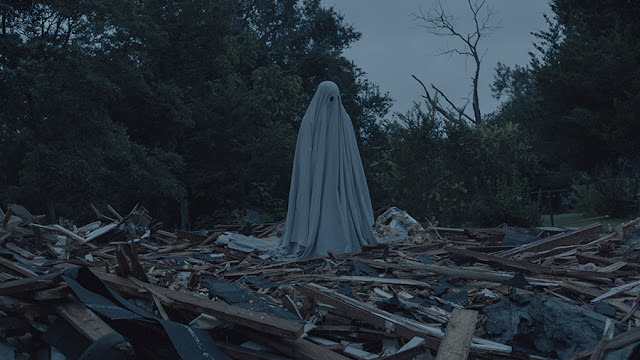 But despite the presence of a ghost and supernatural elements (even a ghost in a closet), A Ghost Story isn’t a horror movie. Broaching broad themes, it deals with legacy, with the lingering traces of ourselves we leave behind in the places we’ve been and the people we’ve touched, and the echoes and reverberations that remain as time moves on, trailing ghosts of ghosts in an endless cycle. 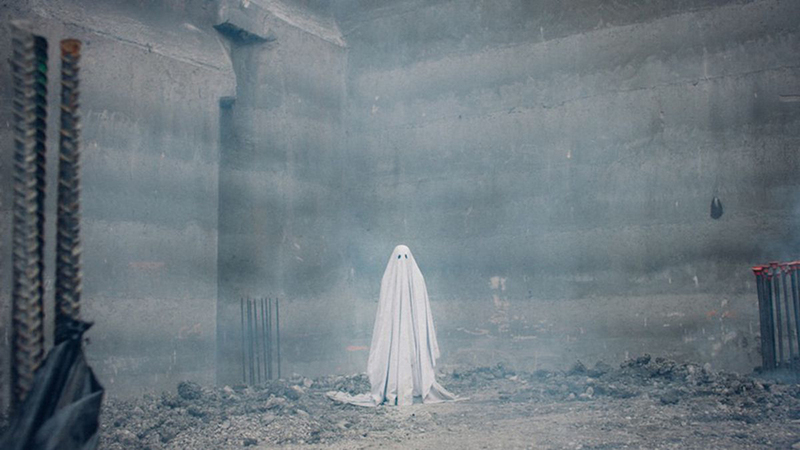 Filmed in an unusual 1.33:1 aspect ratio (the traditional television standard that looks even blockier on the big screen), A Ghost Story has a boxy closeness, an intimacy that resembles old, weathered home movies you might find in a shoebox in an elderly relative’s garage. It creates a near-voyeuristic sensation. Confined as it is to a single setting, the frame forms and extension of the house itself, another way C remains enclosed and restricted, desperate to be remembered, to endure.